American law prevents military aid to countries that employ child soldiers—but that hasn’t stopped us in South Sudan. Malakal, South Sudan— I didn’t really think he was going to shoot me. There was no anger in his eyes. His finger may not have been anywhere near the trigger. He didn’t draw a bead on me. Still, he was a boy and he was holding an AK-47 and it was pointed in my direction. I don’t know how old he was. I’d say 16, though maybe he was 18 or 19. But there were a few soldiers nearby who looked even younger—no more than 15. When I was their age, I wasn’t trusted to drive, vote, drink, get married, gamble in a casino, serve on a jury, rent a car, or buy a ticket to an R-rated movie. It was mandatory for me to be in school. The law decreed just how many hours I could work and prohibited my employment in jobs deemed too dangerous for kids—like operating mixing machines in bakeries or repairing elevators. No one, I can say with some certainty, would have thought it a good idea to put an automatic weapon in my hands. But someone thought it was acceptable for them. A lot of someones actually. Their government—the government of South Sudan—apparently thought so. And so did mine, the government of the United States. There was a reason that boy pointed his weapon my way. A lot of them, in fact. In the most immediate sense, I brought it upon myself. I was doing something I knew could get me in trouble, but I just couldn’t help myself. I tried to take a picture. Okay, I took a picture. More than one. Public photography is frequently frowned upon in South Sudan. Take pictures of the wrong thing and the authorities might force you to delete the images, or confiscate your camera, or maybe worse. The incident in question took place during last year’s rainy season on the outskirts of sodden Malakal, a war-ravaged town 320 miles north of the capital, Juba. The airport, near the banks of the White Nile, had devolved into an airstrip. Nobody seemed to use its vintage blue and white terminal building anymore. Instead, you drove past cold-eyed Rwandan peacekeepers, United Nations troop trucks, and an armored personnel carrier or two, right up to the tarmac. That’s where I was when a fairly big, nondescript white plane arrived. That in itself was hardly remarkable. It’s de rigueur for Malakal. If it isn’t a World Food Program flight, then it’s a big-bellied plane hauling in supplies for some non-governmental organization or a United Nations plane like the one that brought me there and that I was waiting for to whisk me away. This nondescript white plane, however, was different from the others. When the Canadair CRJ-100, with “Cemair” written across its tail, taxied up and its door opened, it wasn’t your typical array of airline passengers who sallied down the gangway. At least not at first. It was a large group of young men in camouflage uniforms carrying assault rifles and machine guns. And they were met on the runway by scores of similarly attired, similarly armed young men who had arrived in a convoy just minutes earlier. I’d never seen anything like it, so I pulled out my phone and tried to surreptitiously take a few photos. Not surreptitiously enough, though. A commander spotted me, got angry, and headed my way, waving his finger “no.” It was then that this boy with the AK-47, who had arrived in the convoy, turned toward me—following the officer’s gaze—and the rifle in his arms turned with him, and I stepped lively to put the commander between me and him, while quickly shoving my phone in my pocket and apologizing again and again. Approximately 13,000 children have been recruited into armed groups in South Sudan, according to the United Nations Children’s Fund (UNICEF). In addition, about 400,000 youngsters have been forced out of school due to the civil war that has been flaring and simmering there for almost a year and a half. How so many children came to be affected by the conflict and why so many of them find themselves serving in the national army, the main rebel force, and other militias needs to be explained. It has much to do with civil wars that started in the 1950s and lasted for the better part of five decades, pitting rebels in the south against the government in the north of what was then a single country: Sudan. Other factors include the 2005 peace deal that led to an independent South Sudan and transformed a guerrilla force into a national military, the Sudan People’s Liberation Army or SPLA; a rural culture in which cows are king because they are currency and young boys are armed to defend against cattle raids, as well as to conduct them; and an armed grudge match between political rivals representing different tribal groups in South Sudan that began in December 2013. Add all of this together and any tangible recent progress toward ridding South Sudan of the scourge of child soldiers has been obliterated. Oh yes, and into that mix you would also have to factor the United States, a country that, as then–US senator, now Secretary of State John Kerry put it, helped “midwife” South Sudan into existence. In 1996, the United States began funneling military equipment through nearby Ethiopia, Eritrea, and Uganda to rebels in southern Sudan as they battled for independence. A decade later, after the civil war ended in a peace deal, Washington officially began offering military “assistance” to the SPLA, according to State Department documents. At that point, without fanfare and far from the prying eyes of the press, the United States launched a concerted campaign to transform the SPLA from a guerrilla force into a professional army. Ford also emphasized that no “lethal equipment” was provided and noted that the lessons were designed to “give soldiers the tools and skills that would benefit the civilian population.” It sounded almost like they were building a South Sudanese Peace Corps. In reality, there was more to it. US support was not strictly a kumbaya effort of medical clinics and human rights instruction. It included the training and equipping of the elite presidential guard; the construction of a new SPLA headquarters in Juba; the renovation of a training center at the SPLA Command and Staff College in Malou, a town north of the capital; and the construction of the headquarters of two SPLA divisions in the towns of Mapel and Duar. 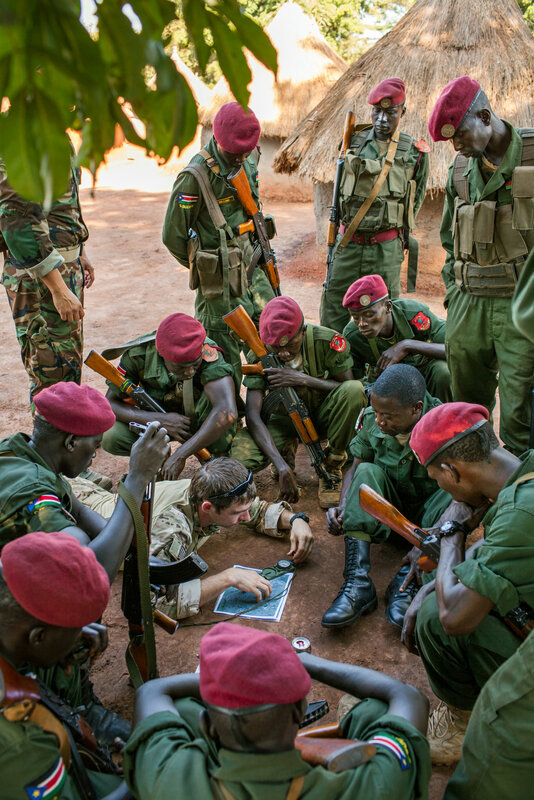 Included as well were training programs for general officers and senior instructors; the deployment of a “training advisory team” to guide the overhaul of intelligence, communications, and other key functions; the employment of Kenyan and later Ethiopian instructors to teach basic military skills to SPLA recruits; the provision of secure voice and data communications to SPLA general headquarters; the development of riverine forces and up to 16 tactical watercraft; military police instruction; the training of commando forces by Ethiopian troops; and the establishment of a noncommissioned officers academy at Mapel with training from private contractors and later US military personnel. And according to a comprehensive report focusing on the years 2006-2010 by Richard Rands for the Small Arms Survey at the Graduate Institute of International and Development Studies in Geneva, this list only encompasses part of Washington’s efforts. During the early 2000s, as thousands of refugee “Lost Boys” who had fled the civil war in southern Sudan began to be resettled in cities across theUnited States, their brothers and sisters back home continued to suffer as civilians or as child combatants. Between 2001 and 2006, however, as international pressure mounted and the civil war waned, some 20,000 child soldiers were also reportedly demobilized by the SPLA, although thousands remained in the force for a variety of reasons, including an extreme lack of other opportunities. While child soldiers, in fact, remained in the SPLA, the United States nonetheless engaged in a years-long effort to pour billions of dollars in humanitarian aid, as well as hundreds of millions of dollars of military and security assistance, into South Sudan. Here’s the catch in all this: the Child Soldiers Prevention Act (CSPA), passed by Congress in 2008 and enacted in 2010, prohibits the United States from providing military assistance to governments using child soldiers. This means that the Obama administration should have been barredfrom providing South Sudan with military assistance in 2011. The government, however, relied on a technicality to gain an exemption—claiming the list of barred countries was created before the new nation formally came into existence. 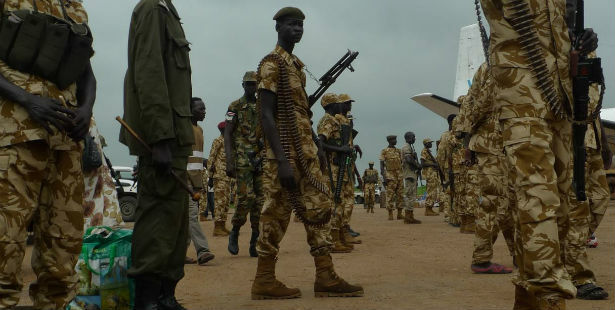 Washington’s support for the SPLA continued even as militia groups with children under arms were folded into the force. The United States flung open the doors of advanced US military schools, training centers, colleges, and universities to SPLA personnel. In 2010 and 2011, for example, US taxpayers footed the bill for some of them to attend US military armor, artillery, intelligence, and infantry schools; in 2012 and 2013, it was the National Defense University, the US Army’s Command and General Staff College, the Marine Corps Combat Service Support School, and the Naval Post Graduate School in Monterey, California, among other institutions. At the same time it was attempting to transform the SPLA into a national army, the US military began operating from an outpost in South Sudan’s hinterlands. At a Combined Operations Fusion Center in Nzara, a small contingent of US Special Operations forces worked with South Sudanese military intelligence as part of Observant Compass, an operation focused on degrading or destroying Joseph Kony’s murderous Lord’s Resistance Army (LRA). Planes and helicopters, flown by private contractors, ferried US troops in and out of the small camp. It was also used by special ops personnel for training SPLA forces in everything from navigation skills to airmobile helicopter assaults and as a staging area for joint raids against the LRA in the Democratic Republic of Congo. 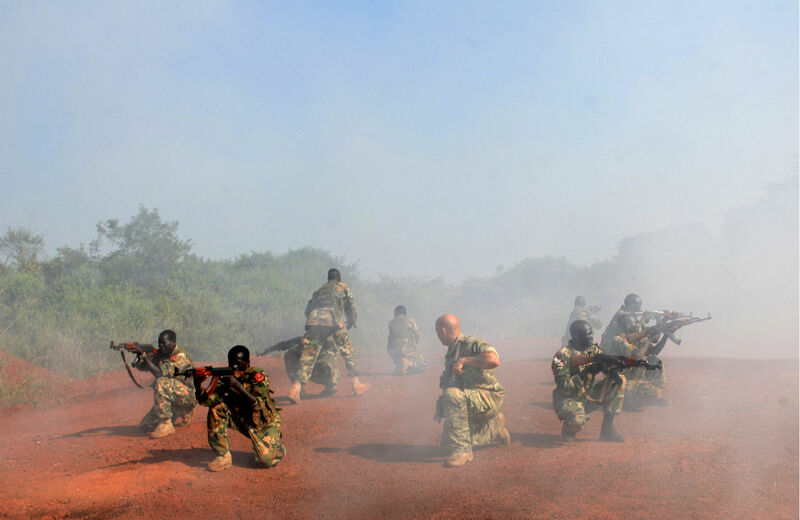 Until just weeks before the civil war broke out in South Sudan in 2013, US special operators were conducting military assault drills at Nzara. As the United States was pouring money and effort into building up the country’s armed forces, human rights groups repeatedly complained about its military’s use of children. This isn’t to say that the Obama administration turned a blind eye to the practice. It was, in fact, much worse than that. On September 28, 2012, for example, Assistant Secretary of State for African Affairs Johnnie Carson issued a strong statement against the use of children as combatants. “Protecting and assisting children affected by armed conflict and preventing abuses against them is a priority for the United States,” he announced. “We remain committed to ending the unlawful recruitment and use of child soldiers, including in the Democratic Republic of the Congo (DRC).” Carson went on to note that, adhering to provisions of the Child Soldiers Prevention Act, the United States would indeed withhold certain security assistance to the DRC (though not all of it). That same day, President Obama issued a statement of his own, waiving the application of the Child Soldiers Prevention Act with respect to several nations (as the act indeed allows a president to do). South Sudan was included on the grounds that such a decision was in “the national interest of the United States.” It was not, as it happens, in the interest of the children of South Sudan, not at least according to a senior United Nations official who was not authorized to speak on the record. The US waiver “was doing more harm than good because there is absolutely no political will to solve the child soldier problem,” that official explained to me. In September 2013, Obama issued still another CSPA waiver—in the form of a memorandum to Secretary of State Kerry—keeping South Sudan eligible for US military assistance and the licenses needed to buy military equipment, again citing national interest. By the end of the year, South Sudan had collapsed into civil war with many SPLA soldiers, especially those of the Dinka tribe, remaining loyal to President Salva Kiir’s government and others, predominantly of Nuer ethnicity, joining former Vice President Riek Machar’s rebel forces. Members of the SPLA were almost immediately implicated in mass atrocities, including the killing of Nuer civilians. That presidential guard, trained and equipped by the United States a few years earlier, was especially singled out for its brutal crimes. Machar’s opposition forces, including many Nuers formerly with the SPLA, carried out their own atrocities, including large-scale massacres of Dinka civilians and others. The State Department soon issued a report, indignant over the fact that “since the outbreak of conflict on December 15,  there have been reports of forced conscription by government forces and recruitment and use of child soldiers by both government and antigovernment forces”—precisely the behavior the president had told the secretary of state was in the American national interest just a few months earlier. That’s not quite how the United Nations actually put it. By May 2014, UNICEF estimated that 9,000 children had been recruited into the armed forces of both sides in the civil war, despite the fact that under “both international and South Sudanese law, the forcible or voluntary recruitment of persons under the age of 18, whether as a member of a regular army or of an informal militia, is prohibited.” Today, that number is estimated to have grown to 13,000. Skye Wheeler, an expert on South Sudan at Human Rights Watch, agrees that the government hasn’t done much. “The SPLA is entirely aware that at least two former militiamen who are now fighting with the government and who have both been integrated into the army are using and recruiting numerous child soldiers but have not made any significant steps towards punitive action,” she told me recently by email. She added that she also knows of no significant efforts to curb the recruitment of children by Machar’s SPLA-IO. Last fall, US Ambassador to the United Nations Samantha Power chaired a meeting of the U.N. Security Council on children and armed conflict in which she declared: “Perpetrators have to be held accountable. Groups that fail to change their behavior must be hit where it hurts.” A State Department official who refused to be named for this piece was equally unequivocal when it came to South Sudan. “Since the outbreak of the conflict, there have been no waivers issued,” he told me in late March, “and we have expressed our concerns about the recruitment of children by multiple parties in the current conflict.” But months earlier—just weeks after Power’s pronouncement and nearly a year after the civil war in South Sudan began—President Obama had indeed issued another partial waiver allowing continued support for the country, despite the prohibitions of the Child Soldiers Prevention Act. In fact, the way that waiver was issued did not sit well with some. “We were disappointed that a partial waiver was put in place last year again without a clear and public statement by the [US government] that this was purely to allow certain activities (support to IGAD monitors and anti-LRA activities) and that the government would not be receiving any significant military support until the abuses, including use and recruitment of child soldiers, are properly addressed,” HRW’s Skye Wheeler told me. She was referring to the Intergovernmental Authority on Development’s Monitoring and Verification Mechanism for South Sudan, set up in January 2014 to support mediation of the current civil war. The State Department acknowledged the absence of such a declaration, but emphasized that the United States had expressed its “concern” about the issue to Kiir’s government. Asked about South Sudan’s response to those concerns, Burnett foggily replied that there were “differences of opinion about the extent to which [recruitment of children by the SPLA] is happening; arguments that when it’s happening it’s done by the opposition or other armed groups that are outside of [SPLA] control.” In other words, after years of copious aid, effort, and waivers, the United States can’t even get the government of South Sudan to acknowledge its wrongdoing when it comes to recruiting child fighters, let alone halt it. But what about US accountability? Does the United States, after years of waivers, bear a responsibility for helping to entrench South Sudan’s practice of using child soldiers? “In and of itself, it could be perceived as sanctioning the practice, but in the day-to-day reality of engaging, we were a strong advocate for moving beyond the practices that had been historically taking place and removing any child soldiers within the SPLA,” says Andy Burnett. “I’m not saying we deserve full credit,” he told me, even as he argued that the president’s waivers had led to real progress. Young children with toy guns, Tomping Protection of Civilians Site, Juba, South Sudan, July 2014. Walking through a camp for internally displaced persons at a U.N. base in South Sudan’s capital, Juba, one blazing hot day last summer, I watched a young girl in a bright pink dress and sporting a huge smile, and a somewhat younger boy in pink shorts and gray sandals chase each other through the muck. Each of them was holding a tiny, black plastic pistol and pretending to shoot the other, just the type of game I reveled in as a boy. As they raced around me, splattering mud and laughing, however, I began to wonder if one day just a few years down the road, she might be pressed into cooking or carrying water for soldiers and he might find himself with a real weapon thrust into his hands. It’s a sad fact that, not so many years from now, I might well encounter that young boy—his toy pistol exchanged for a real assault rifle—on some out-of-the-way tarmac in the hinterlands of South Sudan. Should that day ever come, I imagine I’ll feel just as unnerved as I did that morning in Malakal when a boy soldier turned his weapon in my direction. I’ll then find little comfort in President Obama’s contention that looking the other way on child soldiers is in “the national interest of the United States.” And I’m sure I’ll be just as disturbed that those “interests”—cited by a president who has his own kids—so easily trumped the interests of that boy in Malakal and the rest of South Sudan’s children.